This was waiting in my email box this afternoon... from an old friend of mine. Awesome! 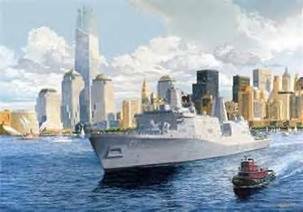 USS New York is about 45 percent complete and should be ready for launch in mid-2007. Katrina disrupted construction when it pounded the Gulf Coast last summer, but the 684-foot vessel escaped serious damage, and workers were back at the yard near New Orleans two weeks after the storm. Junior Chavers, foundry operations manager, said that when the trade center steel first arrived, he touched it with his hand and the "hair on my neck stood up."